The U.S. government — along with a number of leading security companies — recently warned about a series of highly complex and widespread attacks that allowed suspected Iranian hackers to siphon huge volumes of email passwords and other sensitive data from multiple governments and private companies. But to date, the specifics of exactly how that attack went down and who was hit have remained shrouded in secrecy. This post seeks to document the extent of those attacks, and traces the origins of this overwhelmingly successful cyber espionage campaign back to a cascading series of breaches at key Internet infrastructure providers. The DNS part of that moniker refers to the global “Domain Name System,” which serves as a kind of phone book for the Internet by translating human-friendly Web site names (example.com) into numeric Internet address that are easier for computers to manage. 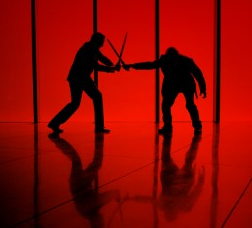 Talos said the perpetrators of DNSpionage were able to steal email and other login credentials from a number of government and private sector entities in Lebanon and the United Arab Emirates by hijacking the DNS servers for these targets, so that all email and virtual private networking (VPN) traffic was redirected to an Internet address controlled by the attackers. Talos reported that these DNS hijacks also paved the way for the attackers to obtain SSL encryption certificates for the targeted domains (e.g. webmail.finance.gov.lb), which allowed them to decrypt the intercepted email and VPN credentials and view them in plain text. On January 9, 2019, security vendor FireEye released its report, “Global DNS Hijacking Campaign: DNS Record Manipulation at Scale,” which went into far greater technical detail about the “how” of the espionage campaign, but contained few additional details about its victims. About the same time as the FireEye report, the U.S. Department of Homeland Security issued a rare emergency directive ordering all U.S. federal civilian agencies to secure the login credentials for their Internet domain records. As part of that mandate, DHS published a short list of domain names and Internet addresses that were used in the DNSpionage campaign, although those details did not go beyond what was previously released by either Cisco Talos or FireEye. That changed on Jan. 25, 2019, when security firm CrowdStrike published a blog post listing virtually every Internet address known to be (ab)used by the espionage campaign to date. The remainder of this story is based on open-source research and interviews conducted by KrebsOnSecurity in an effort to shed more light on the true extent of this extraordinary — and ongoing — attack. The “indicators of compromise” related to the DNSpionage campaign, as published by CrowdStrike. I began my research by taking each of the Internet addresses laid out in the CrowdStrike report and running them through both Farsight Security and SecurityTrails, services that passively collect data about changes to DNS records tied to tens of millions of Web site domains around the world. 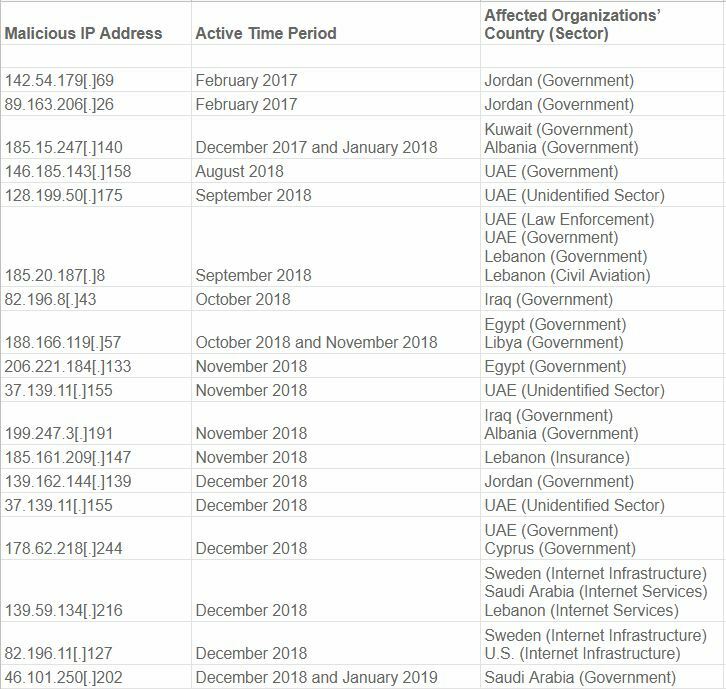 Working backwards from each Internet address, I was able to see that in the last few months of 2018 the hackers behind DNSpionage succeeded in compromising key components of DNS infrastructure for more than 50 Middle Eastern companies and government agencies, including targets in Albania, Cyprus, Egypt, Iraq, Jordan, Kuwait, Lebanon, Libya, Saudi Arabia and the United Arab Emirates. 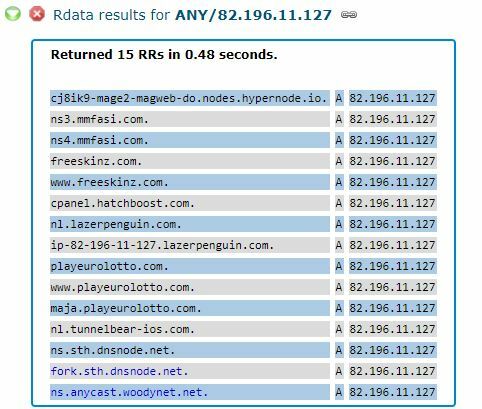 The passive DNS data provided by Farsight and SecurityTrails also offered clues about when each of these domains was hijacked. In most cases, the attackers appear to have changed the DNS records for these domains (we’ll get to the “how” in a moment) so that the domains pointed to servers in Europe that they controlled. Shortly after the DNS records for these TLDs were hijacked — sometimes weeks, sometimes just days or hours — the attackers were able to obtain SSL certificates for those domains from SSL providers Comodo and/or Let’s Encrypt. The preparation for several of these attacks can be seen at crt.sh, which provides a searchable database of all new SSL certificate creations. Let’s take a closer look at one example. 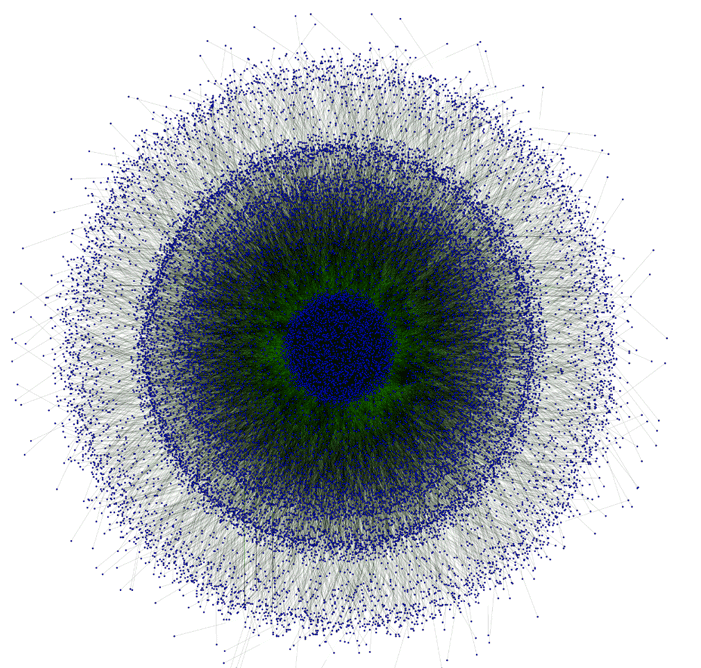 The CrowdStrike report references the Internet address 139.59.134[. ]216 (see above), which according to Farsight was home to just seven different domains over the years. Two of those domains only appeared at that Internet address in December 2018, including domains in Lebanon and — curiously — Sweden. The first domain was “ns0.idm.net.lb,” which is a server for the Lebanese Internet service provider IDM. From early 2014 until December 2018, ns0.idm.net.lb pointed to 194.126.10[. ]18, which appropriately enough is an Internet address based in Lebanon. 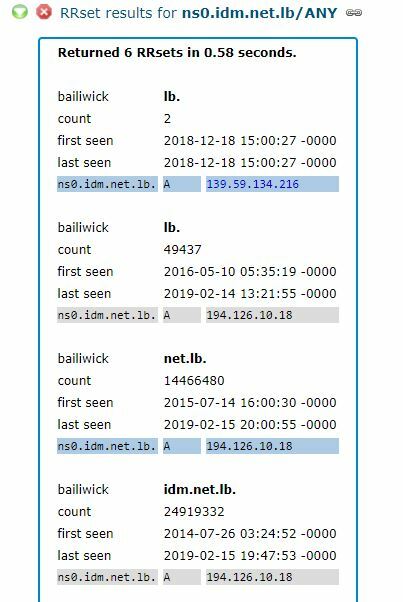 But as we can see in the screenshot from Farsight’s data below, on Dec. 18, 2018, the DNS records for this ISP were changed to point Internet traffic destined for IDM to a hosting provider in Germany (the 139.59.134[. ]216 address). The DNS records for the domains sa1.dnsnode.net and fork.sth.dnsnode.net also were changed from their rightful home in Sweden to the German hosting provider controlled by the attackers in December. These domains are owned by Netnod Internet Exchange, a major global DNS provider based in Sweden. 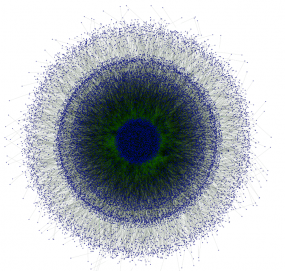 Netnod also operates one of the 13 “root” name servers, a critical resource that forms the very foundation of the global DNS system. We’ll come back to Netnod in a moment. 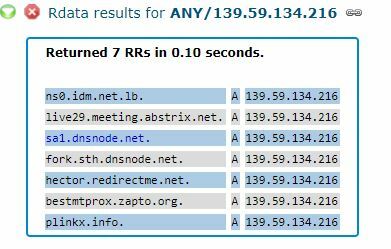 But first let’s look at another Internet address referenced in the CrowdStrike report as part of the infrastructure abused by the DNSpionage hackers: 82.196.11[.]127. This address in The Netherlands also is home to the domain mmfasi[. ]com, which Crowdstrike says was one of the attacker’s domains that was used as a DNS server for some of the hijacked infrastructure. As we can see in the screenshot above, 82.196.11[. ]127 was temporarily home to another pair of Netnod DNS servers, as well as the server “ns.anycast.woodynet.net.” That domain is derived from the nickname of Bill Woodcock, who serves as executive director of Packet Clearing House (PCH). The New York Times this week published a fascinating story about a young programmer in Ukraine who’d turned himself in to the local police. The Times says the man did so after one of his software tools was identified by the U.S. government as part of the arsenal used by Russian hackers suspected of hacking into the Democratic National Committee (DNC) last year. It’s a good read, as long as you can ignore that the premise of the piece is completely wrong. 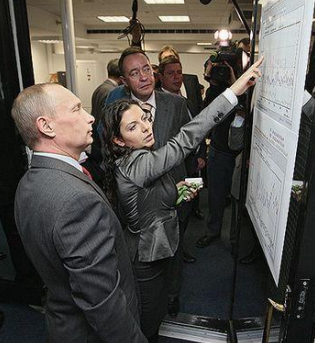 The Times’ reasoning for focusing on the travails of Mr. Profexer comes from the “GRIZZLYSTEPPE” report, a collection of technical indicators or attack “signatures” published in December 2016 by the U.S. government that companies can use to determine whether their networks may be compromised by a number of different Russian cybercrime groups. The only trouble is nothing in the GRIZZLYSTEPPE report said which of those technical indicators were found in the DNC hack. In fact, Prefexer’s “P.A.S. Web shell” tool — a program designed to insert a digital backdoor that lets attackers control a hacked Web site remotely — was specifically not among the hacking tools found in the DNC break-in. The P.A.S. Web shell, as previously offered for free on the now-defunct site profexer[dot]name. That’s according to Crowdstrike, the company called in to examine the DNC’s servers following the intrusion. In a statement released to KrebsOnSecurity, Crowdstrike said it published the list of malware that it found was used in the DNC hack, and that the Web shell named in the New York Times story was not on that list. Robert M. Lee is founder of the industrial cybersecurity firm Dragos, Inc. and an expert on the challenges associated with attribution in cybercrime. In a post on his personal blog, Lee challenged The Times on its conclusions. “The GRIZZLYSTEPPE report has nothing to do with the DNC breach though and was a collection of technical indicators the government compiled from multiple agencies all working different Russian related threat groups,” Lee wrote. 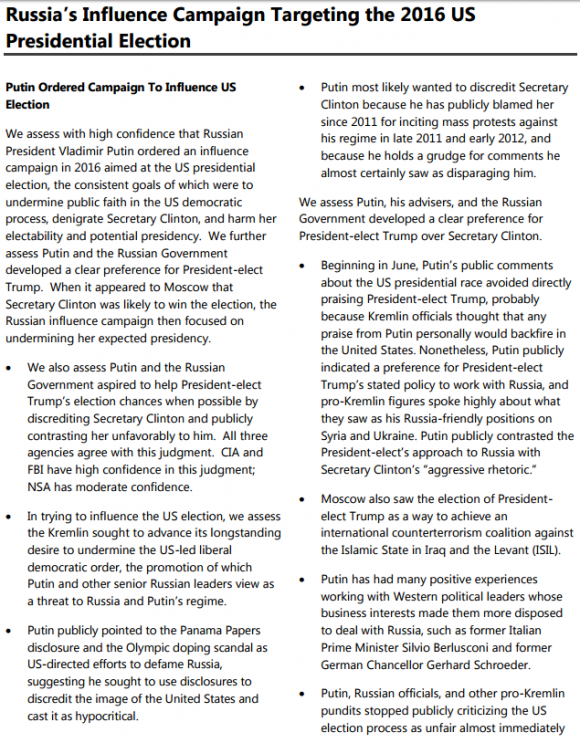 Russian President Vladimir Putin directed a massive propaganda and cyber operation aimed at discrediting Hillary Clinton and getting Donald Trump elected, the top U.S. intelligence agencies said in a remarkable yet unshocking report released on Friday. “We assess with high confidence that Russian military intelligence (General Staff Main Intelligence Directorate or GRU) used the Guccifer 2.0 persona and DCLeaks.com to release US victim data obtained in cyber operations publicly and in exclusives to media outlets and relayed material to WikiLeaks,” the DNI report reads. The report is a quick and fascinating read. One example: It includes a fairly detailed appendix which concludes that the U.S.-based but Kremlin-financed media outlet RT (formerly Russia Today) is little more than a propaganda machine controlled by Russian intelligence agencies. “Moscow’s influence campaign followed a Russian messaging strategy that blends covert intelligence operations—such as cyber activity—with overt efforts by Russian Government agencies, state-funded media, third-party intermediaries, and paid social media users or ‘trolls,'” reads the report. However, those who’ve been clamoring for more technical evidence to support a conclusion that Russian intelligence agencies were behind the phishing, malware attacks and email leaks at The Democratic National Committee (DNC) and Clinton campaign likely will be unmoved by this report. Those details will remain safely hidden from public view in the classified version of the report. Last week, the FBI and Department of Homeland Security issued a joint report (PDF) on some of the malware and Internet resources used in the DNC intrusion. But many experts criticized it as a poorly-written, jumbled collection of threat indicators and digital clues that didn’t all quite lead where they should. Others were perplexed by the high confidence level the agencies assigned to the findings in their unclassified report, noting that neither the FBI nor DHS examined the DNC hard drives that were compromised in the break-in (that work was done by private security firm Crowdstrike). Granted, trying to reconstruct a digital crime scene absent some of the most important pieces of evidence is a bit like attempting to assemble a jigsaw puzzle with only half of the pieces. But as digital forensics and security expert Jonanthan Zdziarksi noted via Twitter last night, good old fashioned spying and human intelligence seems to have played a bigger role in pinning the DNC hack on the Russians. Key findings from the DNI report. New research into a notorious Eastern European organized cybercrime gang accused of stealing more than $100 million from banks and businesses worldwide provides an unprecedented, behind-the-scenes look at an exclusive “business club” that dabbled in cyber espionage and worked closely with phantom Chinese firms on Russia’s far eastern border. In the summer of 2014, the U.S. Justice Department joined multiple international law enforcement agencies and security firms in taking down the Gameover ZeuS botnet, an ultra-sophisticated, global crime machine that infected upwards of a half-million PCs. 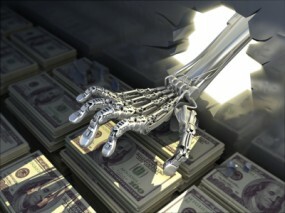 Thousands of freelance cybercrooks have used a commercially available form of the ZeuS banking malware for years to siphon funds from Western bank accounts and small businesses. Gameover ZeuS, on the other hand, was a closely-held, customized version secretly built by the ZeuS author himself (following a staged retirement) and wielded exclusively by a cadre of hackers that used the systems in countless online extortion attacks, spam and other illicit moneymaking schemes. Last year’s takedown of the Gameover ZeuS botnet came just months after the FBI placed a $3 million bounty on the botnet malware’s alleged author — a Russian programmer named Evgeniy Mikhailovich Bogachev who used the hacker nickname “Slavik.” But despite those high-profile law enforcement actions, little has been shared about the day-to-day operations of this remarkably resourceful cybercrime gang. That changed today with the release of a detailed report from Fox-IT, a security firm based in the Netherlands that secretly gained access to a server used by one of the group’s members. That server, which was rented for use in launching cyberattacks, included chat logs between and among the crime gang’s core leaders, and helped to shed light on the inner workings of this elite group. 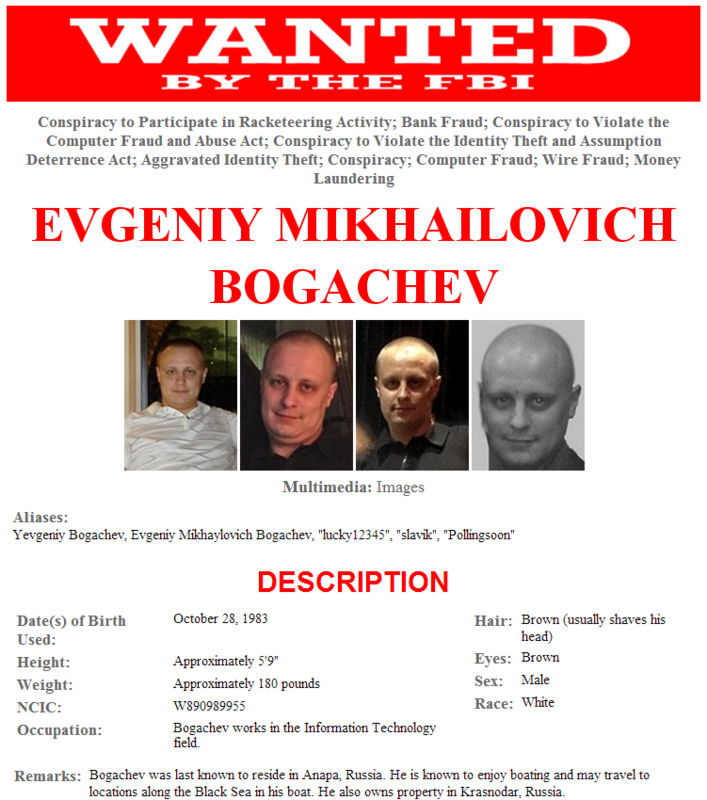 The alleged ZeuS Trojan author, Yevgeniy Bogachev, Evgeniy Mikhaylovich Bogachev, a.k.a. “lucky12345”, “slavik”, “Pollingsoon”. Source: FBI.gov “most wanted, cyber. The chat logs show that the crime gang referred to itself as the “Business Club,” and counted among its members a core group of a half-dozen people supported by a network of more than 50 individuals. 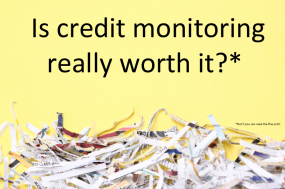 In true Oceans 11 fashion, each Business Club member brought a cybercrime specialty to the table, including 24/7 tech support technicians, third-party suppliers of ancillary malicious software, as well as those engaged in recruiting “money mules” — unwitting or willing accomplices who could be trained or counted on to help launder stolen funds. 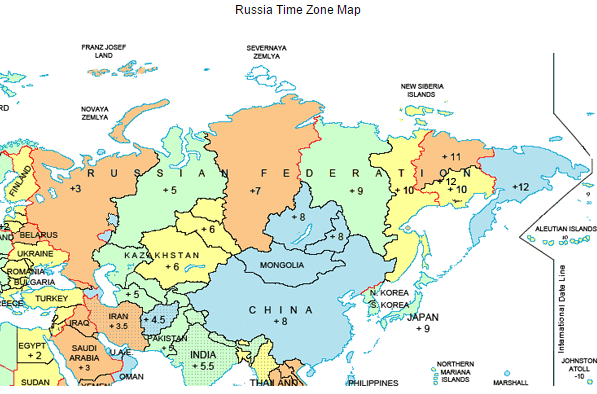 Michael Sandee, a principal security expert at Fox-IT and author of the report, said although Bogachev and several other key leaders of the group were apparently based in or around Krasnodar — a temperate area of Russia on the Black Sea — the crime gang had members that spanned most of Russia’s 11 time zones. Geographic diversity allowed the group — which mainly worked regular 9-5 hour days Monday through Friday — to conduct their cyberheists against banks by following the rising sun across the globe — emptying accounts at Australia and Asian banks in the morning there, European banks in the afternoon, before handing the operations over to a part of the late afternoon team based in Eastern Europe that would attempt to siphon funds from banks that were just starting their business day in the United States. “They would go along with the time zone, starting with banks in Australia, then continuing in Asia and following the business day wherever it was, ending the day with [attacks against banks in] the United States,” Sandee said. Analysis of open source information on the cybercriminal infrastructure likely used to siphon 80 million Social Security numbers and other sensitive data from health insurance giant Anthem suggests the attackers may have first gained a foothold in April 2014, nine months before the company says it discovered the intrusion. The Wall Street Journal reported last week that security experts involved in the ongoing forensics investigation into the breach say the servers and attack tools used in the attack on Anthem bear the hallmark of a state-sponsored Chinese cyber espionage group known by a number of names, including “Deep Panda,” “Axiom,” Group 72,” and the “Shell_Crew,” to name but a few. Deep Panda is the name given to this group by security firm CrowdStrike. In November 2014, Crowdstrike published a snapshot of a graphic showing the malware and malicious Internet servers used in what security experts at PriceWaterhouseCoopers dubbed the ScanBox Framework, a suite of tools that have been used to launch a number of cyber espionage attacks. 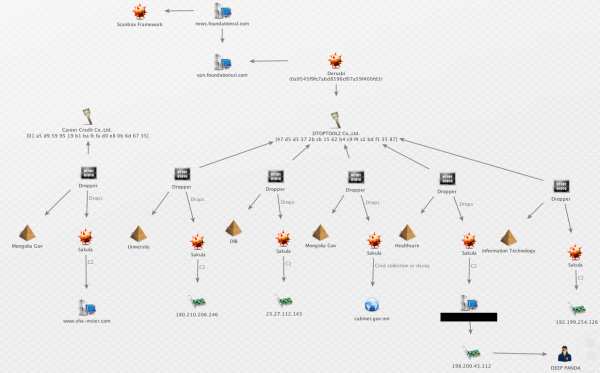 Crowdstrike’s snapshot (produced with the visualization tool Maltego) lists many of the tools the company has come to associate with activity linked to Deep Panda, including a password stealing Trojan horse program called Derusbi, and an Internet address — 198[dot]200[dot]45[dot]112. CrowdStrike’s image curiously redacts the resource tied to that Internet address (note the black box in the image above), but a variety of open source records indicate that this particular address was until very recently the home for a very interesting domain: we11point.com. 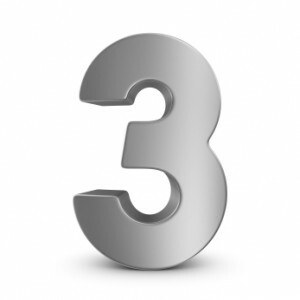 The third and fourth characters in that domain name are the numeral one, but it appears that whoever registered the domain was attempting to make it look like “Wellpoint,” the former name of Anthem before the company changed its corporate name in late 2014. We11point[dot]com was registered on April 21, 2014 to a bulk domain registration service in China. Eight minutes later, someone changed the site’s registration records to remove any trace of a connection to China. Intrigued by the fake Wellpoint domains, Rich Barger, chief information officer for Arlington, Va. security firm ThreatConnect Inc., dug deeper into so-called “passive DNS” records — historic records of the mapping between numeric Internet addresses and domain names. That digging revealed a host of other subdomains tied to the suspicious we11point[dot]com site. 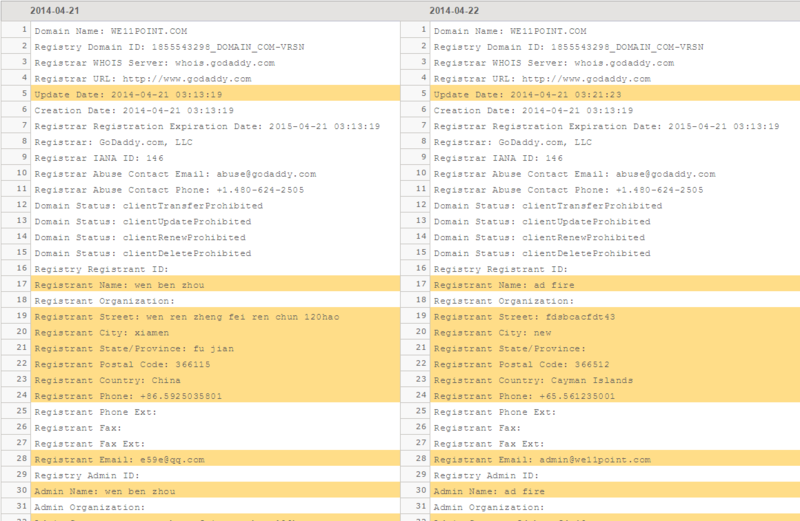 In the process, Barger discovered that these subdomains — including myhr.we11point[dot]com, and hrsolutions.we11point[dot]com – mimicked components of Wellpoint’s actual network as it existed in April 2014. “We were able to verify that the evil we11point infrastructure is constructed to masquerade as legitimate Wellpoint infrastructure,” Barger said. Another fishy subdomain that Barger discovered was extcitrix.we11point[dot]com. The “citrix” portion of that domain likely refers to Citrix, a software tool that many large corporations commonly use to allow employees remote access to internal networks over a virtual private network (VPN). China To Blame in Anthem Hack? Bloomberg reports that U.S. federal investigators probing the theft of 80 million Social Security records and other sensitive data from insurance giant Anthem Inc. are pointing the finger at state-sponsored hackers from China. 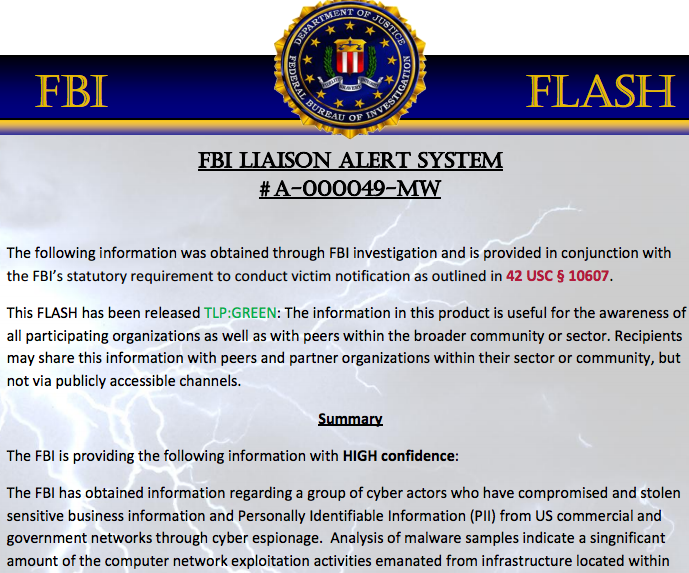 Although unconfirmed, that suspicion would explain a confidential alert the FBI circulated last week warning that Chinese hackers were targeting personally identifiable information from U.S. commercial and government networks. The alert notes that analysis of malware samples used in the attack indicate a significant amount of the computer network exploitation activities emanated from infrastructure located within China. The FBI said the tools used in the attack were referenced in open source reports on Deep Panda, a claim that also shows up in the Bloomberg piece. 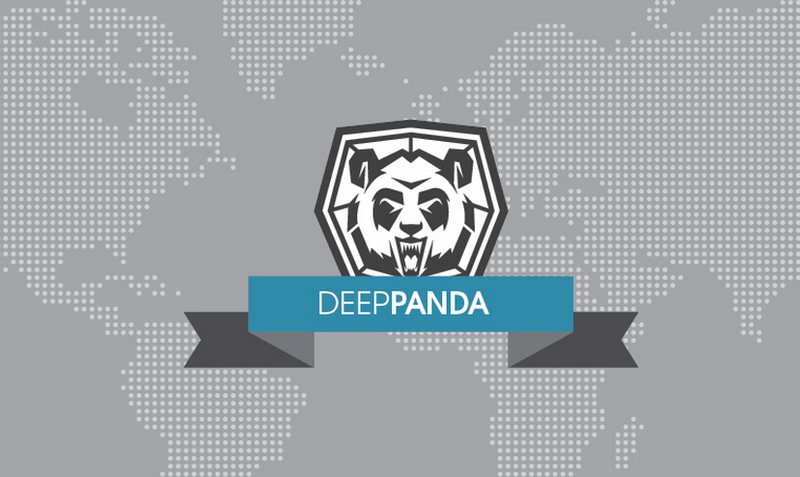 That story references data about Deep Panda from cybersecurity firm CrowdStrike, which specializes in attributing nation state-level attacks. According to the FBI, Deep Panda has previously used Adobe Flash zero-day exploits in order to gain initial access to victim networks. While it may be unrelated, it’s worth noting that in the past two weeks alone, Adobe has shipped no fewer than three unscheduled, emergency updates to address Flash Player vulnerabilities that were being exploited in active attacks at the time Adobe released patches. Millions of Web sites were shuttered Monday morning after Microsoft executed a legal sneak attack against a malware network thought to be responsible for more than 7.4 million infections of Windows PCs worldwide. 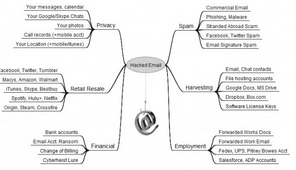 A diagram showing how crooks abused no-ip.com’s services to control malware networks. Source: Microsoft. In its latest bid to harness the power of the U.S. legal system to combat malicious software and cybercrooks, Microsoft convinced a Nevada court to grant the software giant authority over nearly two dozen domains belonging to no-ip.com, a company that provides dynamic domain name services. 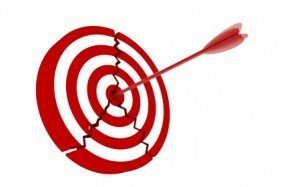 Dynamic DNS services are used to map domain names to numeric Internet address that may change frequently. Typically, the biggest users of dynamic DNS services are home Internet users who wish to have a domain name that will always point back to their home computer, no matter how many times their ISP changes the numeric Internet address assigned to that computer. In this case, however, the attackers responsible for leveraging two malware families — remote-access Trojans known as “njrat” and “njw0rm” — were using no-ip.com’s services to guarantee that PCs they infected would always be able to reach the Internet servers. Microsoft told the court that miscreants who were using these two malware strains were leveraging more than 18,400 hostnames that belonged to no-ip.com. On June 26, the court granted Microsoft the authority to temporarily seize control over 23 domains owned by no-ip.com — essentially all of the domains that power no-ip.com’s free dynamic DNS services. Microsoft was supposed to filter out the traffic flowing to and from those 18,400+ hostnames, and allow the remaining, harmless traffic to flow through to its rightful destination. But according to no-ip.com marketing manager Natalie Goguen, that’s not at all what happened. Goguen said while Microsoft claimed that there were more than 18,000 malicious hostnames involved, no-ip.com could only find a little more than 2,000 from that list that were still active as of Monday morning. Meanwhile, some four million hostnames remain offline, with customer support requests piling up. The U.S. Justice Department is expected to announce today an international law enforcement operation to seize control over the Gameover ZeuS botnet, a sprawling network of hacked Microsoft Windows computers that currently infects an estimated 500,000 to 1 million compromised systems globally. Experts say PCs infected with Gameover are being harvested for sensitive financial and personal data, and rented out to an elite cadre of hackers for use in online extortion attacks, spam and other illicit moneymaking schemes. The sneak attack on Gameover, dubbed “Operation Tovar,” began late last week and is a collaborative effort by investigators at the FBI, Europol, and the UK’s National Crime Agency; security firms CrowdStrike, Dell SecureWorks, Symantec, Trend Micro and McAfee; and academic researchers at VU University Amsterdam and Saarland University in Germany. News of the action first came to light in a blog post published briefly on Friday by McAfee, but that post was removed a few hours after it went online. Gameover is based on code from the ZeuS Trojan, an infamous family of malware that has been used in countless online banking heists. Unlike ZeuS — which was sold as a botnet creation kit to anyone who had a few thousand dollars in virtual currency to spend — Gameover ZeuS has since October 2011 been controlled and maintained by a core group of hackers from Russia and Ukraine. 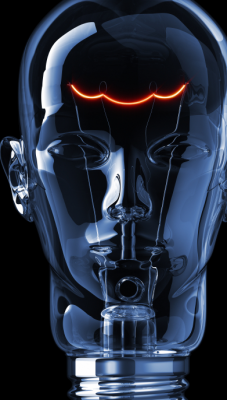 Those individuals are believed to have used the botnet in high-dollar corporate account takeovers that frequently were punctuated by massive distributed-denial-of-service (DDoS) attacks intended to distract victims from immediately noticing the thefts. According to the Justice Department, Gameover has been implicated in the theft of more than $100 million in account takeovers. The curators of Gameover also have reportedly loaned out sections of their botnet to vetted third-parties who have used them for a variety of purposes. One of the most popular uses of Gameover has been as a platform for seeding infected systems with CryptoLocker, a nasty strain of malware that locks your most precious files with strong encryption until you pay a ransom demand. 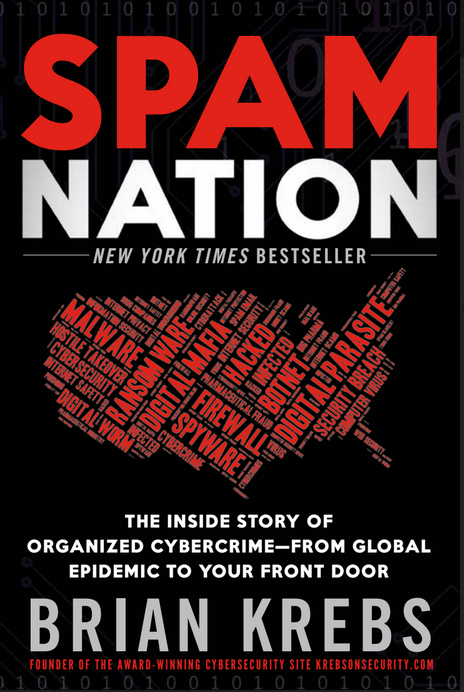 According to a 2012 research paper published by Dell SecureWorks, the Gameover Trojan is principally spread via Cutwail, one of the world’s largest and most notorious spam botnets (for more on Cutwail and its origins and authors, see this post). These junk emails typically spoof trusted brands, including shipping and phone companies, online retailers, social networking sites and financial institutions. 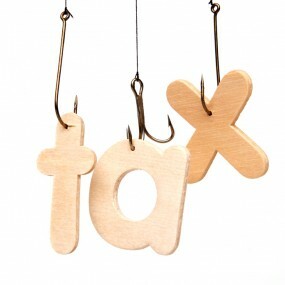 The email lures bearing Gameover often come in the form of an invoice, an order confirmation, or a warning about an unpaid bill (usually with a large balance due to increase the likelihood that a victim will click the link). The links in the email have been replaced with those of compromised sites that will silently probe the visitor’s browser for outdated plugins that can be leveraged to install malware. 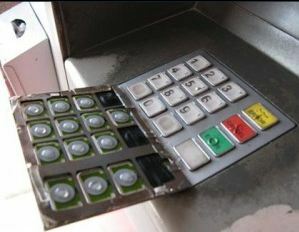 Yesterday’s story about the point-of-sale malware used in the Target attack has prompted a flood of analysis and reporting from antivirus and security vendors about related malware. Buried within those reports are some interesting details that speak to possible actors involved and to the timing and discovery of this breach. As is the case with many data breaches, the attackers in this attack used a virtual toolbox of crimeware to get the job done. As I noted in a Tweet shortly after filing my story Wednesday, at least one of those malware samples includes the text string “Rescator.” Loyal readers of this blog will probably find this name familiar. That’s because Rescator was the subject of a blog post that I published on Dec. 24, 2013, titled “Who is Selling Cards from Target?“. In that post, I examined a network of underground cybercrime shops that were selling almost exclusively credit and debit card accounts stolen from Target stores. I showed how those underground stores all traced back to a miscreant who uses the nickname Rescator, and how clues about Rescator’s real-life identity suggested he might be a particular young man in Odessa, Ukraine. A private message on cpro[dot]su between Rescator and a member interested in his card shop. Notice the ad for Rescator’s email flood service at the bottom. Earlier this morning, Seculert posted an analysis that confirmed my reporting that the thieves used a central server within Target to aggregate the data hoovered up by the point-of-sale malware installed at Target. According to Seculert, the attack consisted of two stages. Security experts are warning that a newly discovered vulnerability in Internet Explorer 8 is being actively exploited to break into Microsoft Windows systems. Complicating matters further, computer code that can be used to reliably exploit the flaw is now publicly available online. In an advisory released May 3, Microsoft said it was investigating reports of a vulnerability in IE8, and that it was aware of attacks that attempt to exploit this bug. 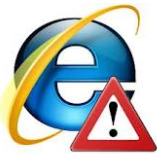 The company stresses that other versions of IE — including IE6, 7, 9 and 10 are not affected by the vulnerability. However, all versions of IE8 are vulnerable, including copies running on Windows XP, Vista and Windows 7. Meanwhile, a new module that exploits this IE8 bug is now available for the Metasploit Framework, a free penetration testing tool. I would expect this exploit or some version of it will soon be rolled into commercial exploit kits that are sold in the cybercrime underground (assuming this has not already happened). 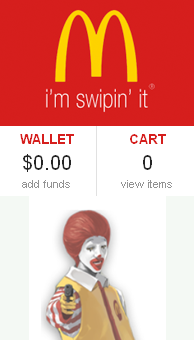 Update, May 9, 9:00 a.m. 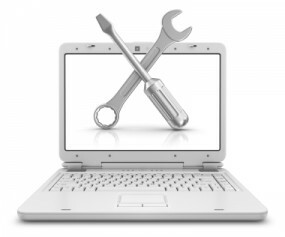 ET: Microsoft has released a fix-it tool to blunt attacks on this bug. See this story for more information. 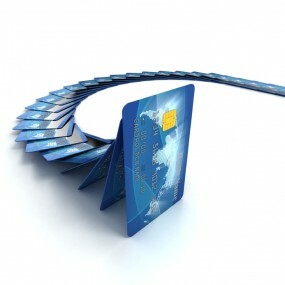 The security hole has already been leveraged in at least one high-profile attack. 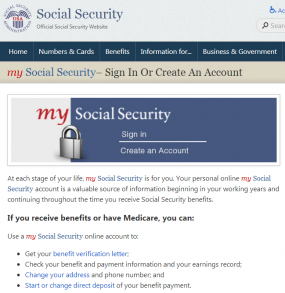 Over the weekend, several security vendors reported that the U.S. Department of Labor Web site had been hacked and seeded with code designed to exploit the flaw and download malicious software. The attack on the Labor Department site is seen as a watering hole attack, which involves the targeted compromise of legitimate websites thought to be of interest to or frequented by end users who belong to organizations that attackers wish to infiltrate. Previous watering hole attacks have targeted the Web site for the Council on Foreign Relations, the Association of Southeast Asian Nations, and the National Democratic Institute. According to CrowdStrike, the server used to control this latest attack on the Labor Department site was microsoftupdate.ns1.name. The company said analysis of the logs from the attacker’s infrastructure revealed that visitors from 37 different countries browsed the site during the time it was compromised with the malicious code. AlienVault, Invincea and Cisco Systems have published additional details on this attack. AlienVault also said it has since spotted the same exploit used on at least nine other hacked Web sites, including several non-profit groups and a large European company.